I considered attaching the zoom to a slidebar instead of a checkbox to make it more dynamic, but the scaling provided by GDI+ (which I had to use because reasons) really isn't that great. I decided it wouldn't provide any significant amount of usefulness compared to the current static scaling factor to be worth the effort. If you think otherwise, I can do it, tho. I also considered having the GUI remember your current selections between sessions, but the only truly reliable way to do so would be to write the current values to an INI file on each and every change. Writing to disk that way would considerably slow down the "instant" response I was going for, so I decided against it. If the consensus is that such a feature would be significantly beneficial, I can do it and try to minimize the impact on performance as much as possible. Just let me know (preferable sooner rather than later while the inner workings of the project are still fresh on my mind). Indeed, a slider (or simply second checkbox) to allow choosing between x1, x2 and x4 might be a cool addition, but nothing more. Any other scales will distort exact pixels of the picture so are useless. There's no need to remember selection between sessions IMO, it's nothing but one mouse click per session after all! That is if I read your post right and by remembering selection you meant selection of paperdoll zoom. I'd like to ask for refresh hotkey as well, F5 will do fine The reason for that request is that now, when I routinely add (and save) yet another 3 pixels in Photoshop, I had to switch to some other paperdoll in PM and switch back to original one for the changes to take effect. It would be very handy to have a hotkey making PM to re-read active paperdoll from the file. Also, as a totally minor request, no, mere idea even, perhaps it would be useful to someone to be able not only to export the palette, but also to import it back - right now there's no such option unless I'm missing something. Edited by Creepin, 22 November 2017 - 12:35 AM. All of this should be possible. I'm working on a new component to one of my mods, but after I finish it up I'll see what I can do with this. Let me know if you find any bugs or have any more improvement suggestions. Based on my use experience I still believe that a discrete slider (x1/x2/x4/x8 should be enough) would be of better use. Current continous slider randomly provides me with something like x3.97 or x4.02 when I try to set it to x4, which distorts the picture while upscaling it, this is understandable but interfere with the attempts to evaluate how the picture would look in game. Some pixel missed here, another pixel added there and you're on the wild goose chase Or may be it's possible to keep continuous slider but made x2, x4 and x8 values to "magnet" a bit? Edited by Creepin, 24 January 2018 - 06:24 AM. 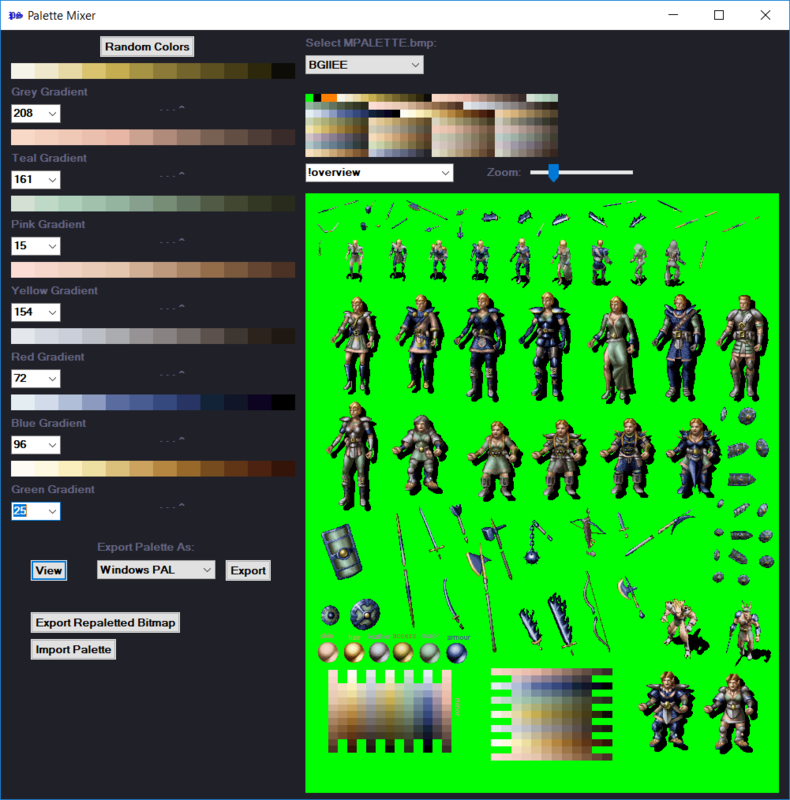 See if PaletteGenerator V3.2.0 is any better. Instead of scaling the image by a percentage, it now scales it by a factor from 1/8 to 8. Note that the tooltip on the slider will display numbers to the left as negative. Interpret them as a factor of 1/N instead of -N, and 0 will probably result in a scaling factor equivalent of x1 since a divide-by-zero results in a blank string which will result in "no-change" when updating the image dimensions. Implementations isn't perfect, but hopefully the end result is better. I have a mixed feelings about this release. Scaling by factor of 2/4/8, the main feature requested, works perfectly and is exactly what is needed, although now that I think of it from the perspective of picture distortion there was nothing wrong with x3, x5 and so on, only fractional numbers of your previous slider were distorting pixels. OTOH, downscaling functionality seems unnecessary, as well as having 3 slider positions (-1, 0, 1) for the same 1:1 scale. Do you think the slider might be made perfect by restricting it to upscaling by the factor of the whole numbers x1,x2,x3,x4,x5,x6,x7 and x8? Edited by Creepin, 25 January 2018 - 02:49 AM. I have a mixed feelings about this release. [...] OTOH, downscaling functionality seems unnecessary, as well as having 3 slider positions (-1, 0, 1) for the same 1:1 scale. Do you think the slider might be made perfect by restricting it to upscaling by the factor of the whole numbers x1,x2,x3,x4,x5,x6,x7 and x8? I guess that's what I get for pushing out a quick hack without bothering to really think it through. I am unwilling to drop down-scaling altogether, but I have removed duplicate slider positions and confusing tooltips for V3.2.1. The zoom slider now starts in the center, and anything to the right is up-scaling and anything to the left is down-scaling. I've updated the default paperdolls that come with PaletteGenerator to be a little more user friendly. The program itself is the same. Also, because it was requested, the paperdolls from 1ppv4 are included in ".\PaletteGenerator\res\paperdolls\1ppv4_inv.rar". Extract the files to ".\PaletteGenerator\res\paperdolls\" if you want PaletteGenerator to be able to use them.